As a family we are always looking for ways to cut down on our grocery bills. We like to cook with fresh herbs and use a lot of them, which starts to add up! So for at least half of the year we grow our own herbs on our windowsill. When you grow your own produce it tastes fresher, minimizes pesticide exposure, you don’t have to worry about recalls on tainted produce and you can have fun doing it as a family! Although, sometimes I have bad luck with growing certain herbs from seedlings which is why we are huge fans of Bonnie Plants. 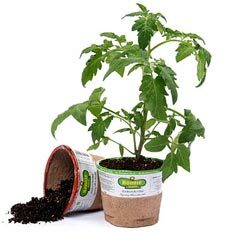 I love to use Boonie’s Plants, they use biodegradable peat pots which prevents transplant shock by allowing the roots to remain intact from container to soil. Bonnie’s exclusive peat pots have already prevented more than 100 million pounds of plastic from ending up in landfills. They’ve also dramatically reduced energy and petroleum required in the manufacture of plastic pots. Be sure to check the company out when you start to plan your garden! I have been using Bonnie ‘ts tomatoes for years and never had a problem untill this yr.